As stylish as the new, slimmer Xbox 360 is, all Xbox 360 fans really want is something to play Halo on. And if it looks like Halo, all the better. 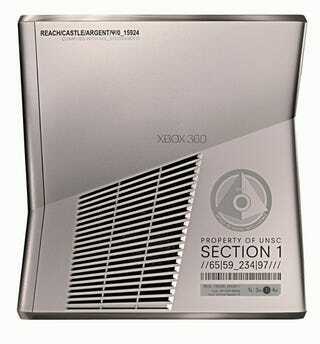 The Halo Reach themed Xbox 360 does away with the slick black look of the redesigned 360, replacing it with a rather cheap-looking silver (effect) coating. It has the same 250GB hard drive inside, only a small amount of space has been set aside for some "custom sound effects from the Halo universe."